Lemongrass Ginger Green Tea Blend not only tastes delicious hot or cold, but keeps your tummy yummy! Lemongrass Ginger Green Tea Blend is made from all organic ingredients to include green tea, ginger root, lemon grass and lemon myrtle. The healthy green tea sets the stage and is only enhanced by the combination of both the lemongrass and lemon myrtle offering a fresh lemony taste. This is all complemented by the ginger spice taste of the ginger root. The refreshingly well balanced flavor is a welcome side-effect of this tea that helps keep the tummy healthy. A versatile tea that can be enjoyed either hot or iced. 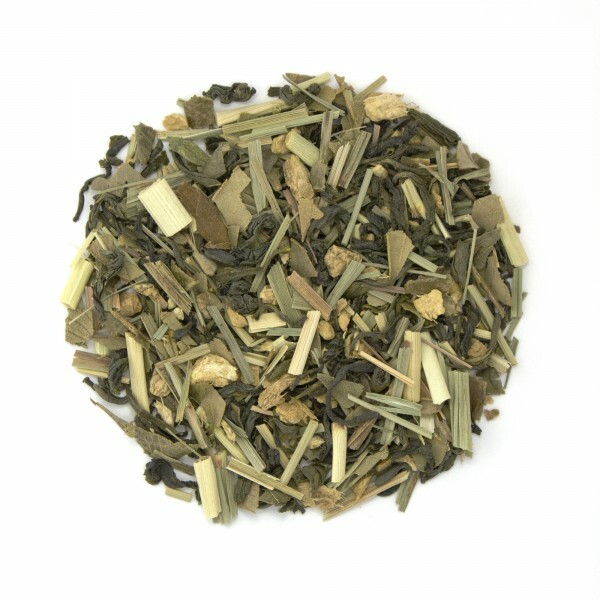 Lemongrass Ginger Green Tea Blend is a household favorite. Consider combining Lemongrass Ginger Green Tea Blend along with another favorite of ours, Golden Monkey Black Tea. This will make a perfect tea collection! Be the first to review “Lemongrass Ginger Green Tea Blend” Click here to cancel reply.